As she saw the wolf(Chelsea) speak she ran into white fur. Panic ran threw her blood stream until the sent of Shadow entered her nostrils, her blood seemed to calm as she entered homeostasis. The pup was still a bit shaky, but Shadow seemed to reassure the pup that she was safe with her. "A-a..A wolf.....popped out of no where..." Her voice was a bit shaky as she nuzzled into Shadow pointing where the wolf had gone with her muzzle. 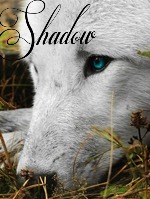 Listening to the pup speak of another wolf Shadow lifted her muzzle into the air, parting her incisors and inhaled the slightly frigid air she detected the familiar scent belonging to a pack wolf. "The wolf wouldn't harm you, Yoki, you are safe here," the ivory pelted wolf whispered in the pups ear. Grooming the pups head, Shadow attempted to calm the startled pup and herself. The moment of panic made the femmora wonder for what reasons did she react so suddenly and without thought. Closing her glacial optics, the fae burried her nose in the pups fur and murmured, "when you feel ready we can begin to make our way back." Amethyst had woken up to the sound of two others talking and roaming around the den. She carefully got up and allowed a yawn to come to her. She stretched her back and other muscles, as she started to exit the den. She saw to others that were a few feet from where they were. Another wolf and a pup (Shadow and Yoki). She carefully walked over to the two. Being careful not to scare away the pup, she said in a soft voice, "Hello there. I'm not sure if you know me or not, but I'm from around here. That pup is cute by the way. Can't wait to have one of my own someday". She looked at the pup and smiled. She sat down a few centimeters away from the two, just to give them some personal space. She waited until either Shadow or Yoki replied to her. rose gets up and lets out a loud yawn, she looks around her seeing whats new around the den. she stands up and she starts to run around trying to start play, after a while she gets tired and trots off a bit away from the den and sits down, as she sits on a sharp rock that cuts into her rump, she lets out a small yelp from it and stands up and she says to herself since no one else is near " gosh why do i always get the cuts? ", as she scoots over to sit in a different spot. 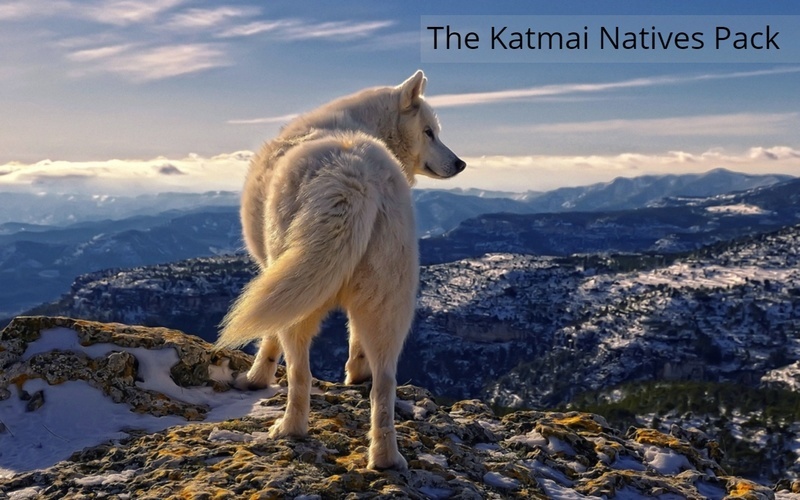 she sees a small animal and starts to chase it, it looked like a rat thing but she chased it around and finally she got its tail and she let it go and chased it again, soon she got tired and headed back to the den looking at the other wolves shyly. as she curled up in the den she say a couple of wolves not far talking but she was to tired to move and fell asleep. Arrow got up his muscular body now looking nothing like him. He walked out of the den hearing voices. One young two he knew and the other he did not know very well. He walked weakly out, since he had not eaten in a month. He walked over to his mate and licked he cheek, to show his love to her. He then said hi to shadow. He looked at the pup with his dull blind eyes, hoping not to scare her." And who might you be? He asked kindly in a soft tone. Waiting for a reply. Amethyst looked at Arrow who was licking her cheek lovingly. She licked him back. "Haven't seen you in such a long time...". She leaned her head on him for a moment for both their scents to mix in with each other. Her tail wagged lowly. She layed down and took a deep breath. For a few moments did she feel the pup inside her kicking. She kinda giggled at that. "This pup is going to be so cute when its born..." She said quietly. She then turned her attention back to the two (Shadow and Yoki). Her gold eyes sparkled with love for her mate. She haden't heard from him in a long while. That's why she felt so happy. Shadow's pale blue optics opened at the sound of paw steps. Slowly lifting her cranium to eye the approaching figure the fae relaxed recognizing the light grey coat belonging to Amethyst. A smile formed upon her maw as she listened to Amethyst's hopes of raising young pups. It was odd to even think that a few weeks ago Shadow would have cringed away from the adorable young creatures. Remaining quiet, the ivory fae observed Amethyst's devoted mate, Arrow, approach the small circle. "Good day Arrow?" The femmora asked politely as she wrapped her snowy tail around the small brown pup protectively. Leaning down, the fae nuzzled the pup and gave her slight nudge encouraging her to approach the wolves and to signal that they would bring no harm to her. rose starts to wake up, she heads outside of the den feeling the warm sun, she gives a small yawn and starts to trot around full of energy and joy, being a little carless she runs around the edges of the densite not caring about anything at all. as she starts to run she sees an elk not far. she builds up her strength and lunges at it giving a ferce bite she takes it down to the ground, she got a little hurt from the elk but she finishes it off, her paw hurts a bit but she enjoys the kill with a couple small bites, she howls for the rest of the pack to come have some food, then she trots off to be alone for a while. far away from the others she lays down and looks at her right paw right by her scar there was a small cut, she gave a angry grunt and got up trying not to show her pain from the small cut she walk under a small tree her eyes shimmered in the light ,she closed her eyes to sleep again. Lightly sinking her teeth into the pup's scruff, the ivory pelted female gently carried the pup back into the den before returning out into the fresh air. Catching a glimpse of snowy fur against the melting snow a low growl escaped the fae's clenched jaws. A wicked gleam sparked in her glacial orbs as she dropped down into a crouch and slowly stalked forward. Drawing closer to her unsuspecting target, the female edged around her chosen victim in an attempt to remain out of the snowy wolf's sight. Pushing off with her hind legs, the fae soared through the air, her jaws parting to release a louder snarl as she landed on her victim's back. "So, what's new, Ihana?" Shadow asked casually as she sat atop the snowy wolf. Chelsea still continued keeping her head high and her ears perked. As she walked further and further, the sound of voices faded. Taking in a deep breath she took off running, the light female enjoying the cool breeze brushing against her fur. But catching a glimpse of the area ahead of her, she slowed down. Her usually pale eyes seemed to sparkle as she came upon the edge of the forest leading out to the hunting grounds. Chelsea grinned Later Chelsea, later. she thought slowly making her way back to the den. Ihana bit into the fresh kill laid before her. Her teeth sunk into the juicy carcass of a rabbit and she savored the taste. She had killed this rabbit by herself, and she felt proud even though she knew she could have caught more than that. As she bent to take another bite of her tasty kill, something fell on top of her, making her fall flat on her face, straight into the rabbit. The wolf flattening her was obviously bigger than her, and she barred her teeth into a rabbit-muffled snarl. Then she heard the voice of the wolf that was crushing the small white fae, and she grunted. 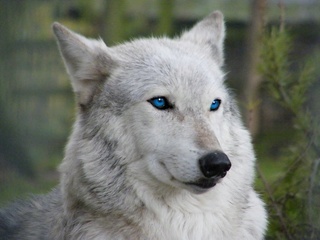 She squirmed out of the wolf's grasp, and crouch a bit away, her ears flat and her blue orbs filled with mischief. "Searching for fights again, eh? Nothing new is with me, but plenty with you I hear. Congrats on your rank!" She grinned. "Closer to Siren, perhaps..."
Taken aback by the sudden movement beneath her paws, Shadow took a few strides back allowing her victim to adjust her posture. 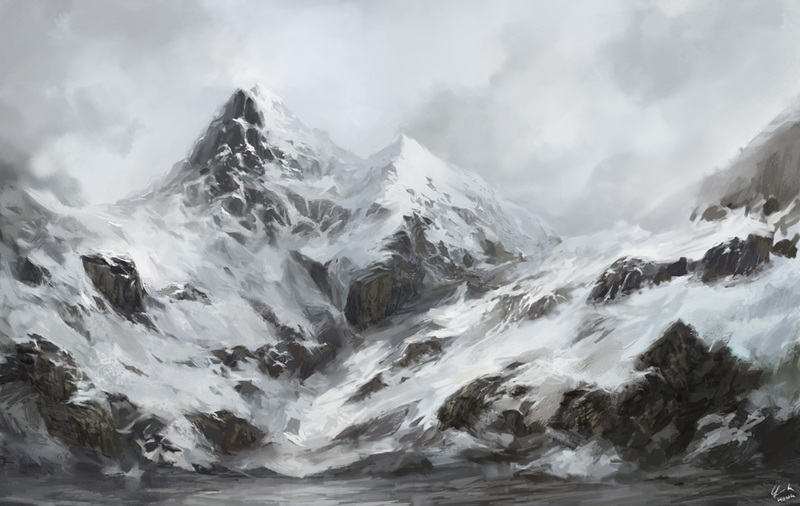 Lowering herself back on her hunches, the ivory femmora kept her glacial optics fixed on Ihanna. A smile curved upon her maw as she listened to Ihana speak and dipped her head politely to the white fae. "Thank you," Shadow replied and chuckled in amusement as she continued speaking, "naturally, who else better to leap upon than yourself, Ihana." Wrapping her white tail around her paws the ivory femmora eyed Ihana with uncertainty as she continued listening. "What are you implying?" The fae spoke slowly interrogating the white wolf before her. The white fae lifted her paw casually, looking at it as she responded craftily, looking up at the feminine wolf. "Oh nothing, nothing at all... Only that you can Siren would be a perfect fit..." She smirked, her blue eyes twinkling with mischievousness at the thought. She crouched low, her muscles rippling through her semi fluffy pelt, as she pounced at the she-wolf she had just been conversing with. She batted at the larger female's ears, grunting playfully. Narrowing her orbs as she listened to the fae speak Shadow took a moment to think over Ihana's words. In the period of thought the fae became withdrawn with reality. Trapped in her world of thought she released a surprised yelp felling the sudden movement of being knocked off her paws. Colliding with the snow along with the piercing sound of Ihana's playful growl brought the ivory fae out her thoughts. Growling in return, Shadow lightly kicked at Ihana with her hind legs attempting to force the fae off without causing harm and with her frontal paws, the femmora attempted to fend off the paw attacking her ears. Yoki's green optics slowly turned down toward her paws. Her ear swerved hearing someone approach and then another. Yoki looked up to see a pair, a brown wolf like her self with green eyes, his mate timber coated with orange or brown optics. The pup's ears flattened as the female began to talk to her in a soft kind voice. Feeling the nudge of Shadow she began to look back at Shadow who seemed to say that they won't harm you. When she was about to approach she was picked up by Shadow and bring her back to the den. Following behind Shadow when she left the den, but sat down near the entrance as she watched Shadow crouch. Watching carefully she saw her pounce and sit on top of a white wolf. Surprised to see a black marking on the she-wolf head, then realized it looked just like that of the stars sparkling in the night sky. Seeing the wolf pin Shadow, Yoki quickly neared; a growl in her throat which quickly disappeared when she saw that the two where only playing. Embarrassed she headed back to the den hoping that Shadow had not seen her. Her attention then quickly got caught on a butterfly, the pup crouched moving slowly but before she was near the yellow wings quickly jerked upward. Flicking her banner the brown pup then quickly jumped toward the butterfly batting at it with her paw and snapping at it until it flew away.